ગુરુ સૂર્યમંડળનો સૌથી મોટો ગ્રહ છે. સૂર્યથી પાંચમાં નંબરે આવેલા આ વાયુથી બનેલા ગ્રહને નક્કર સપાટી નથી. મંગળ અને શનિ ગ્રહોની વચ્ચે ગુરુ આવેલો છે. વિકિમીડિયા કૉમન્સ પર category:ગુરુ વિષયક વધુ દ્રશ્ય-શ્રાવ્ય માધ્યમો (Media) ઉપલબ્ધ છે. ↑ ૩.૦૦ ૩.૦૧ ૩.૦૨ ૩.૦૩ ૩.૦૪ ૩.૦૫ ૩.૦૬ ૩.૦૭ ૩.૦૮ ૩.૦૯ ૩.૧૦ ૩.૧૧ ૩.૧૨ ૩.૧૩ Williams, Dr. David R. (November 16, 2004). 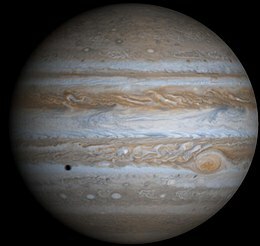 "Jupiter Fact Sheet". NASA. Retrieved 2007-08-08. ↑ Yeomans, Donald K. (2006-07-13). "HORIZONS Web-Interface for Jupiter Barycenter (Major Body=5)". JPL Horizons On-Line Ephemeris System. Retrieved 2007-08-08. — At the site, go to the "web interface" then select "Ephemeris Type: Elements", "Target Body: Jupiter Barycenter" and "Center: Sun". ↑ Orbital elements refer to the barycenter of the Jupiter system, and are the instantaneous osculating values at the precise J2000 epoch. Barycenter quantities are given because, in contrast to the planetary centre, they do not experience appreciable changes on a day-to-day basis due to the motion of the moons. આ પાનાંમાં છેલ્લો ફેરફાર ૧૧ માર્ચ ૨૦૧૯ના રોજ ૧૯:૨૯ વાગ્યે થયો.